A one-stop shop for efficient water infrastructure management. Risk Management is a data driven, proactive and comprehensive program that brings water assets to life through continual monitoring. This package includes three steps: continuous condition assessment, data analysis, and infrastructure management. 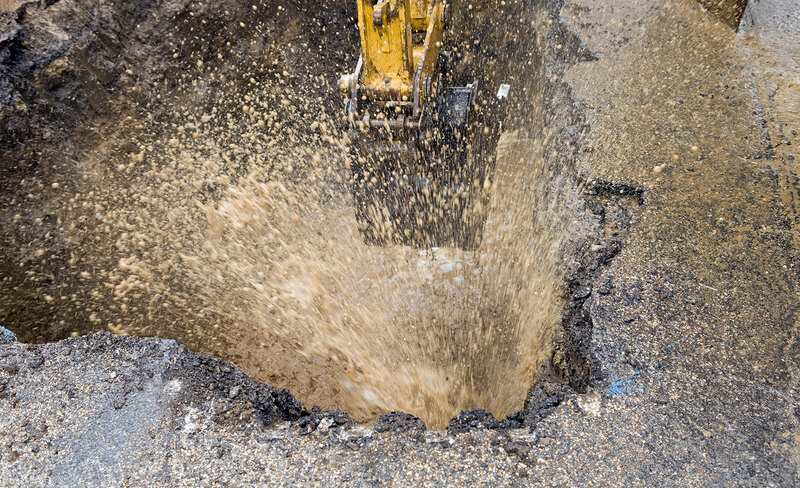 Our risk management services reduce the risk of damage to your assets by bringing transparency to the infrastructure buried underground. It gives us the ability to make intelligent decisions on infrastructure integrity and replacement in real time, increasing the longevity of your water assets and building the case for repairing and replacing problematic areas. Risk management also prevents environmental degradation through reducing water loss, making storm water run-off more manageable and saving your business money on water production costs by ensuring water reaches its intended destination. The first step to minimize the risk of aging pipelines is to continuously monitor the day-to-day status of the water network. Matchpoint will deploy hand selected monitoring equipment to meet each clients specific situation, needs, and distribution system. The technology will highlight any abnormalities and generates real time data of the condition of your water network. This data then flows into our web based software, where it can be accessed and analyzed. We interpret the data provided during the condition assessment phase. Our software automatically predicts and warns of future events, giving our clients the ability to prevent them from happening in the first place. Our analytics team also assesses any anomalies in the data and decides if further investigation is needed. If additional assessment is needed, our crews are deployed to investigate the areas of concern highlighted in the condition assessment phase and realized in data analysis phase. This requires a skillful crew that can select the appropriate technology. We then generate a report on our findings, which is delivered to the client. We offer monitoring of potable and/or wastewater networks. The technology we deploy retrieves data from the monitored areas, generating meaningful information. This information is included in the “Continual Condition Assessment” part of our Risk Management services. This proactive solution also includes District Metered Area (DMA) management. It provides real time information on the integrity of water infrastructure, reduces overall water loss and non-revenue water, and gives our clients priceless knowledge, as they are able to see the condition of their assets improve overtime. Leak detection isn’t a one-time activity. 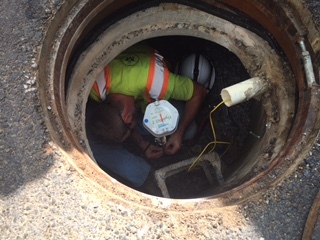 Our leak detection programs help clients evaluate the integrity of their water network by locating and pinpointing leakage. This service is included in the “Infrastructure Management” part of our Risk Management services. Leak detection services are executed on potable waterlines and pipes of all materials and sizes. We can also implement non-invasive methodology and do internal pipe leak detection services. 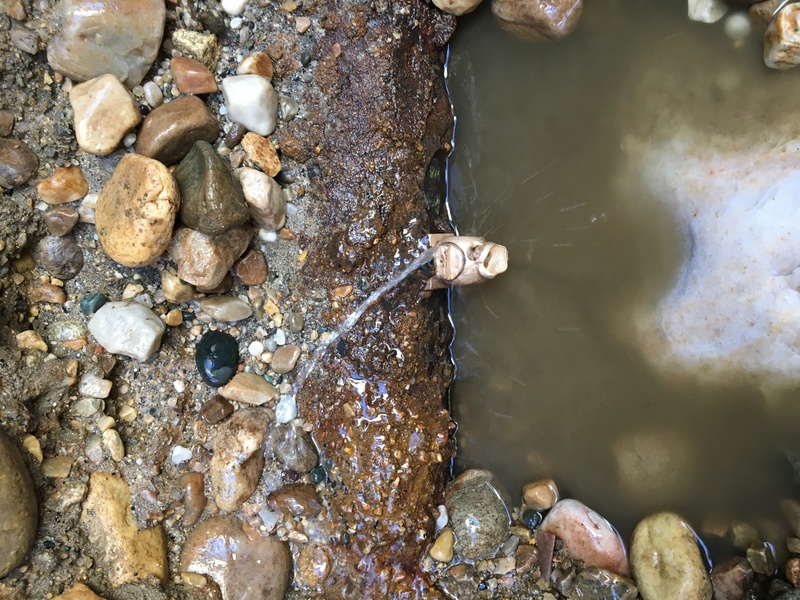 The ability to identify leaks reduces the amount of water that is lost, saves money on non-revenue water, and offers monetary benefits by ensuring treated water reaches its intended destination and isn’t lost in leaky pipes. We can also integrate GIS, which makes our reporting more accurate, and leakage rates are quantified so repairs can be prioritized. See into the pipeline with our intrusive condition assessment services. Matchpoint sources world-renowned Aquam Pipe Diagnostics technology to investigate pipe assets and accurately locate leaks from the inside out. Visual and acoustic In-pipe services are available for surveying large and distribution mains. Up to date Geographic Information Systems (GIS) is a integral part of asset management. Matchpoint has partnered with ESRI in order to provide the most comprehensive and efficient GIS services. In conjunction with or separate to our non-revenue water services, we offer GIS asset collection, digitization, mapping and visual/thermal drone based image capture. Matchpoint validates, verifies and computerizes system information, such as valve, meter, and pipe locations, and makes the data available in GIS format for any software in any datum projection. Sub-meter accuracy and unlimited attribute fields are also available. As digitized system records are easily updatable, they surpass hard copy record-keeping in asset tracking accuracy. 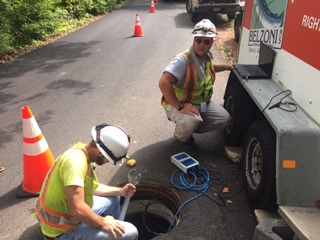 System maintenance services, such as leak detection, become more productive once GIS is implemented, as more time can be spent evaluating the network instead of locating it. Our services extend from developing digitized distribution maps for clients in GIS infancy, to updating records within well-established mapping systems. Data-Driven Solutions are at the heart of Matchpoint’s methodology. Our robust technologies and best practices are grounded in validated and historical data, collected from sensors throughout your system. The knowledge derived from your data empowers your organization to make quick and reliable decisions. Information has a lifecycle and this is our vision. Each Data-Driven Solution is tailored to meet the specific needs of each customer. Contact us directly for details on how the solution may apply to your particular network. Get flow and pressure data without lifting a finger. Technology, installation, data services, and support can all be rented through the HUB, Matchpoint’s premier rental program. The HUB sources a variety of applications from hydraulic modeling, DMA, pilot testing, to meter verification projects. Whether your needs are limited to technology and support, or extend to installation and data service, we can supply it for short and long terms. The HUB provides meaningful system data without all the strings attached. Rent our services and equipment on a one-time or long term basis, whichever is needed to meet your needs. As standard the rental program includes electromagnetic insertion meters and data loggers that monitor the water network on an ongoing basis: sending flow & pressure data remotely for analysis. Remote support, equipment preparation, and calibration services are handled and provided by our Factory Certified Technical Center to ensure data accuracy and to prevent gaps in data. Matchpoint also has a team ready to install the equipment and a team that can analyze the data produced by our technology, should you have a need. We offer training and support with the purchase of equipment to ensure clients know how to use our equipment to its maximum potential, as well as how to identify leak noise and analyze the data produced. This includes lifetime support on all our products sold. Acoustic leak detection is an art form. It takes practice to differentiate background noise from leak noise. Our experts are masters of this art and the equipment we sell is the same equipment we use in the field. Matchpoint’s Certified Technical Center is located within its Wilmington, NC headquarters. The Center has the latest in calibration and repair equipment, including a hydraulic test bench. Our Center is staffed by technicians that are factory-trained by Hydreka, Primayer, and Aquam. These resources allow Matchpoint to provide a customer service experience unique to the U.S NRW and Condition Assessment industry. Rental fleet, calibration without data loss, quick turnarounds on repair and upgrades; all right here in North Carolina. Contact the Technical Center directly with any product servicing questions or needs. Matchpoint’s Operations Dashboard incorporates ESRI technologies with operational intelligence. The result is one fine tool for managing and monitoring field operations. The dashboard displays real-time updates of field activity, progress updates on mileage covered, and a breakdown of leakage to date. It also has a “drill down” capability to view specific point information, including leak data. If interested, Matchpoint offers live demonstrations of the dashboard and other data platforms. This solution provides the “peace of mind” that comes with knowing risks are mitigated and infrastructure integrity is tight. UAV-Based Infrared Assessment includes: reservoir and dam structural integrity analysis; soil and vegetative analysis, infrared assessment of water movement and/or pooling; aqueducts; leak detection/confirmation of “hard to find” areas of interest; areas unreachable by humans, including water towers, rooftops, remote pipelines, etc. ; potable, storm, and wastewater infrastructure.